Samsung Electronics today announced that it has successfully developed the world's first single-sheet, 40-inch active matrix OLED for emissive flat panel TV applications. The high-definition-compatible OLED prototype has a wide screen pixel format of 1280x800 (WXGA) driven by an amorphous silicon (a-Si) active matrix backplane to permit faster video response times with low power consumption. In January Samsung announced that it developed 21-inch single-panel active matrix-based OLED display. An organic light-emitting diode (OLED) is a light-emitting diode (LED) made of semiconducting organic polymers. These devices promise to be much cheaper to fabricate than inorganic LEDs. Varying amounts of OLEDs can be deposited in arrays on a screen using simple "printing" methods to create a graphical colour display, for use as television screens, computer displays, portable system screens, and in advertising and information board applications. OLED panels may also be used as lighting devices. OLEDs are available as distributed sources while the inorganic LEDs are point sources of light. Prior to standardization, OLED technology was also referred to as OEL or Organic Electro-Luminescence. One of the great benefits of an OLED display over the traditional LCD displays found in computer displays is that OLED displays don't require a backlight to function. This means that they draw far less power and they can be used with small portable devices which have mostly been using monochrome low-resolution displays to conserve power. This will also mean that they will be able to last for long periods of time with the same amount of battery charge. Samsung's 40-inch OLED panel will be demonstrated for the first time at the world's largest display industry event, Society for Information Display (SID) 2005 International Symposium, Seminar and Exhibition in Boston, May 24- 27. Manufactured on Samsung's fourth generation (4G) production line with a mother-glass size of 730mm x 920mm, the new OLED prototype combines all of the traditional features of emissive OLED technology, including wide viewing angle, thin package size, no color filter and no backlight, with the enormous production infrastructure advantages of standard a-Si techniques. To date, AM OLED prototypes have used costly polysilicon approaches, which have limited production sizes. Shattering traditional AM OLED size limitations, the new prototype offers a maximum screen brightness of 600 nits; a black-and-white contrast ratio of 5,000:1; and, a color gamut of 80 percent. Motion pictures with ultra-high quality images can be impeccably reproduced by skillfully employing OLED's rapid video response capabilities for image processing of HD-class resolution. The ultra-thin shape of the panels will allow future TV set designers to create televisions with a total thickness of only 3cm or less. 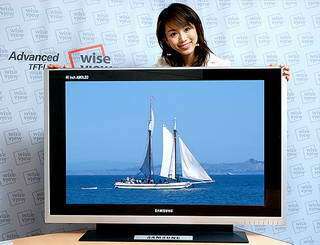 After launching its OLED development initiative in 2001 to secure leadership in next-generation display technologies, Samsung developed a 14.1" WXGA (1280x768) OLED panel in 2004, followed by the world's first 21" HD-class (1920x1080) OLED panel in January, 2005. This ambitious pace of innovation accelerated development of today's unusually large 40-inch OLED prototype, paving the way for large-size OLED TVs. "Our development of a 40-inch OLED will provide a firm basis from which we can become the unassailable market leader in the flat panel display market of the future," said Dr. Kyuha Chung, vice president of Samsung Electronics LCD R&D Center. "We're taking an early leadership position in the next-generation display market, building on Samsung Electronics' success in the TFT-LCD market." Samsung Electronics is the supervisory and lead research institution for detailed implementation of the Ministry of Commerce, Industry & Energy's (MOCIE) Next-Generation Growth Engine Industries Initiative. The latest round of development has been conducted as part of the project, "Development of Solution-Based AM OLED for Low-Cost 4G HDTVs using a-Si."